Ever heard about any phone manufacturer making a laptop plus tablet hybrid? That’s what happening in India right now. Micromax has played their next move in the world of laptop plus tablet hybrid, called as laptab. Micromax Canvas Laptab, the 2-in-1 device will be available starting May 6 initially exclusively on Amazon India at Rs. 14,999. The single-SIM supporting Micromax Canvas Laptab runs on Windows 8.1 with Bing and will also be upgradable to Windows 10 OS. 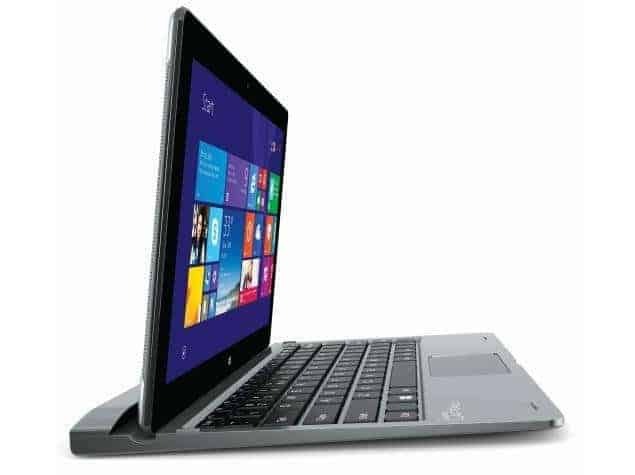 The tablet boats of an 10.1-inch IPS display with a WXGA (1280×800 pixels) resolution and is powered by a 1.33GHz quad-core Intel Atom Z3735F processor (up to 1.83GHz in Burst mode) coupled with 2GB of DDR3L RAM. The Micromax Laptab has 32GB of inbuilt storage, which can be further expanded via a microSD card. The users will also receive 1TB of cloud storage on Microsoft’s OneDrive service. The Canvas Laptab has a 2-megapixel rear and front-facing camera and a 7700mAh battery, which is rated to offer a usage time of 10 hours. It measures 210.8×124.2×9.95mm, weighs 1.1kgs. Connectivity options include Wi-Fi, Bluetooth 4.0, USB and 3G. The Micromax Canvas Laptab offers one year of free subscription for Microsoft Office 365 Personal apps. It also houses dual speakers placed either sides on the rear panel. Commenting on the launch Vineet Taneja, CEO, Micromax Informatics Limited, said, “Today’s launch marks our entry into the PC segment, where we intend to drive category growth and not only garner an available market share. We believe that our vision complements the initiatives for Digital India, and we will be launching a range of exciting products over the next few months in the category.” Micromax had first introduced a device called the LapTab back at CES 2014, revealing it would be dual-boot tablet with Android 4.2.2 Jelly Bean and Windows 8. It was set to launch soon after at under Rs. 30,000. This never happened, and over a year later, the Indian brand has brought a Windows-only version of the tablet to India.